According to the Office of the Comptroller of the Currency’s Quarterly Report on Bank Trading and Derivatives Activities for the Second Quarter 2010 (most recent), the notional value of derivatives held by U.S. commercial banks is around $223.4 Trillion. Five banks account owns 95% of this. $188 Trillion of the $223 Trillion in notional value of derivatives sitting on the Big Banks’ balance sheets is related to interest rates. $188 Trillion is thirteen times the US’ entire GDP, and nearly four times World GDP. 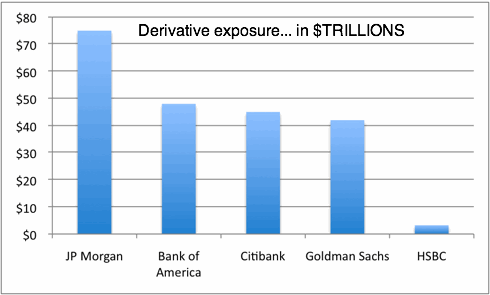 Not all of this money is “at risk,” since the same derivatives can be traded/spread out dozens of ways by different banks as a means of dispersing risk. However, given the amount of money at stake, if even 4% of this money is “at risk” and 10% of that 4% goes wrong, you’ve wiped out ALL of the equity at the top five banks. The Derivative global market is estimated to amount to $600+ Trillion.